Plymouth Citybus have given plenty of notice of their timetable changes planned for 4th December, so rather than wait for the relevant Devon / Cornwall Transit postings here is the run down as given by Citybus themselves. See if you can spot the deliberate mistake! 8/9 – The service will see an enhanced Bank Holiday service and the 18:35 service 9 will receive extra running time to improve reliability. 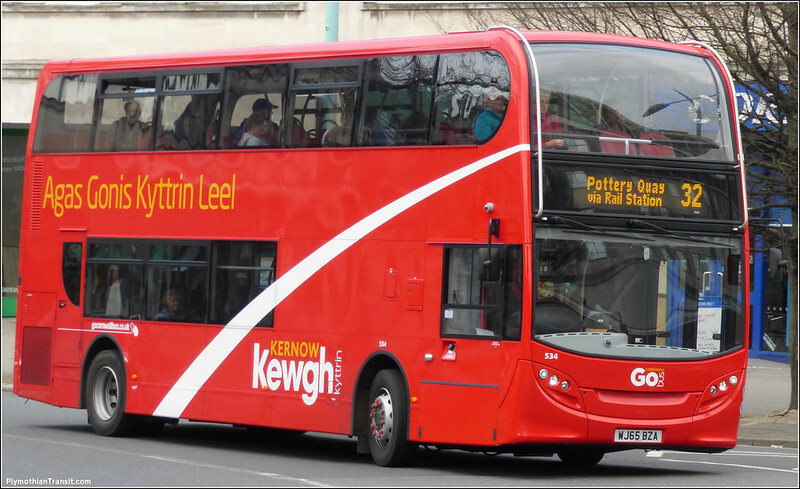 25 – Will see the introduction of a new Sunday and Bank Holiday service. 27/28 – Sunday will see the introduction of an hourly 27 & 28 replacing the current 27B & 28B timetables with late evening journeys withdrawn. 32 – Service will now be serviced by 70/71 (please see Cornwall changes) Will now depart from Stand A3. 33 – Revised Sunday and Bank Holiday Timetable. 40/41 – Due to congestion, morning peak journeys will receive greater running time to improve reliability. Enhanced Bank Holiday service introduced. 44 - Due to congestion, morning peak journeys will receive greater running time to improve reliability. Enhanced Bank Holiday service introduced. 11/11A – Due to the ongoing road works in Bodmin, causing delays to the service, we have had to invest more resource, adding 15 minutes to the running time to improve reliability. 12/12B – To improve reliability we have invested resource, meaning an additional 15 minutes have been added to the overall running time of the service. 70/70A/70B/71 – Services to be re routed via Western Approach, Railway Station, Millbridge and Stoke instead of Union Street, replacing the current service 32. This will improve reliability in Stoke following service monitoring The changes will mean that from the railway station the above services will serve Torpoint. 72 - To improve reliability we have invested resource, meaning an additional 15 minutes have been added to the overall running time of the service. The service will also be re routed to serve Hannafore & Pelynt. 73/74 – Timetable amendments to both services will now enable passengers who catch the bus in Callington and carry on to Looe and Polperro via Liskeard. Service will link Pelynt and Polperro, with a Sunday service to Camping Caradon. The morning 73A will be re routed to serve St Keyne, Duloe, Sandplace, Morval and Widegates. Ok Derriford 50/A to Estover 51 to St Budeaux. But at Estover to Derriford you'll have all three 50 50A 51! How many will get on a 51 at Leigham and get on it again at Derrfirod thinking it'll go back that way. As all three go from Leigham to Derriford won't people think they can get any of them back? This problem might be reduced if the destination displays showed a bit more than the final destination. This 'final destination only' seems to be a practice imported from London - where the detail on destination displays used to be exemplary. Your picture of the 32 shows something a bit more useful - so, if a bus at Derriford showed 'City Centre via St. Budeaux' or 'City Centre via Marsh Mills', people might be a little bit less confused. What would be a real help might be not to change service-numbers quite so often - especially if they are then changed back again a year or so later. Welcome back, 43! Can we have our 76 now, please? The error above I have spotted but won't say so others can try. There is another mistake on the hot topics download on their website - well I assume it is a mistake - see if anyone can spot that one too. Does anyone know when the shelters will be installed at derriford hospital and the busses will be using both sides of the road? I believe it is all supposed to be completed by end of November, but having said that most of the heavy work is now complete. mostly landscaping ongoing at the moment. I dont know if the changes will require to be registered on VOSA, at least for those service changing bus stops?